A challenge for most administrators managing more than one or more Azure subscriptions or Office 365 tenants is having to continuously login and out with different credentials to do so. Many have developed techniques to work around this challenge by using Incognito Windows or Private Browsing and others use multiple Browsers. Even with these methods, you are still limited to using two accounts particularly with Incognito Window or Private Browsing technique. In this post I share my method that enables you to login to multiple Office 365 & Azure accounts in the same browser, on the same device at the same time! Multiple Customer accounts (or through Delegated Administration using my Corporate Office 365 account). Sure, a password manager might help with the login process by storing credentials but this still doesn’t solve the challenge of being signed in to multiple accounts at the same time. The technique I have started using is a feature available in Chrome. 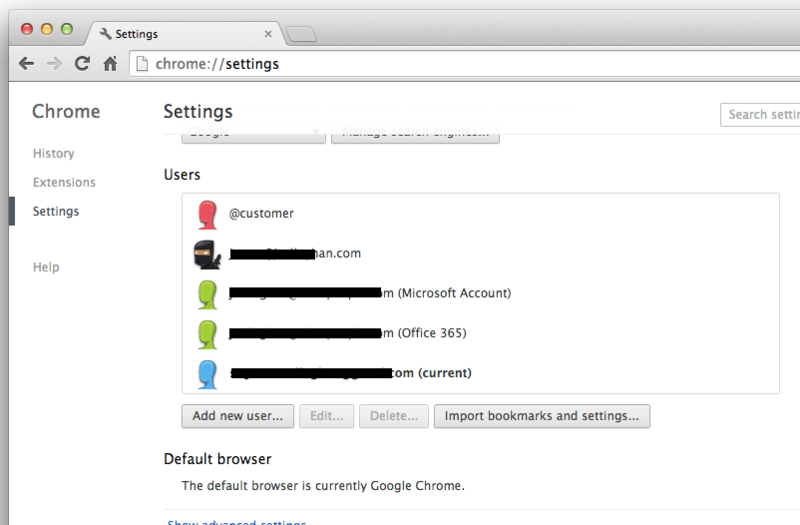 Chrome allows you to create multiple user accounts from the Settings page. I’ve created users for each of the Microsoft accounts I commonly use. Each Chrome user has its own settings such as the plugins installed, the bookmarks that are available, browsing history and the crucial part cookies and Browser sessions. Now when I want to jump between Azure subscriptions or Office 365 tenants I can toggle between Chrome users. The user menu is available in a number of places. Chrome Users is also available on the PC version of Chrome. I hope you find this technique of switching between Azure or Office 365 accounts useful.